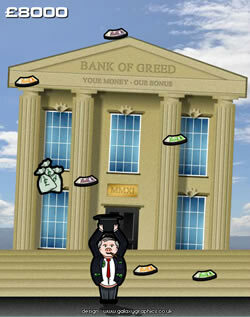 Greedy Banker is in essence a game of catching falling objects of different types and values in order to score points. In this instance it's the banking crisis inspired "grab as much money as you can before your bank collapses" theme. The game could be reskinned in an endless number of ways however, and catching objects is ideal for situations where a perhaps a shooting game is inappropriate. If you are interested in licensing this Greedy Banker game for your own site, or a custom rebranded variation of it, please contact us for more information. Remember, any aspect of the game's graphics or gameplay can be customised to complement your website's content or theme. Looking for Greedy Banker game source code / Actionscript 3.0 / .fla file ? The source code for this game is also available to buy from Galaxy Graphics. Click here to contact us about source code licensing.